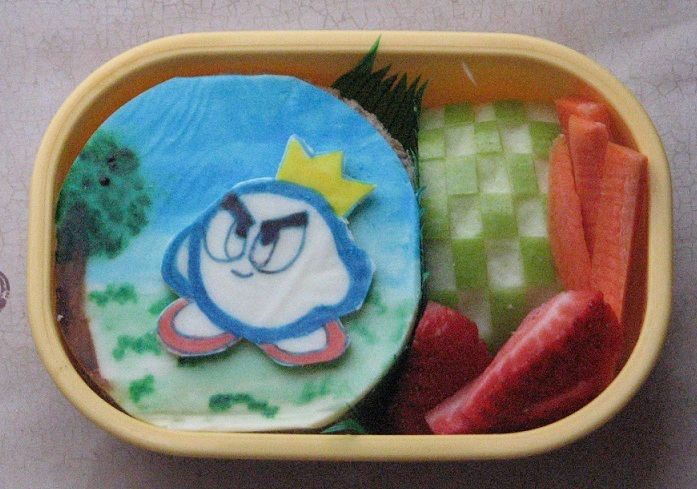 Kidlet and I have been playing Kirby's Epic Yarn and he plays as Prince Fluff so he needed to be in a bento!Bad lighting is brought to you by our lovely snow storm. pfft. And now, for all of you Facebookers, you cane now follow BentoForKidlet :) isn't that fun? Check the box to the right! So I go away for awhile and you've added watercolour backgrounds to your artwork...I mean, food. Nice! Enjoying all the nifty details in this one! Have a great weekend, Jenn! Such great details! Love it! Those all look so good!